Winter’s heavy hand rests on the Eastern Coast. Freezing rains, snow that won’t pack, sullen gray skies, and the toe-numbing cold. What is a mom who believes that “nature is important” to do when the both she and the kids are in danger of turning into screen-zombies? Yesterday, I pulled out a book for inspiration: Hunting Red. The young narrator notices nature all around. She hunts with her eyes for the royal catchfly flower, and with her ears for the piercing whistle of the cardinal. She knows what she finds by name – from the enormous pileated woodpecker to the tiny scarlet cup. And she takes time to just be in nature – sitting quietly against a dead tree trunk or hiking the tallgrass prairie. To notice nature we will have to be in nature. To know nature we will have to be in nature, and we will have to do some research. 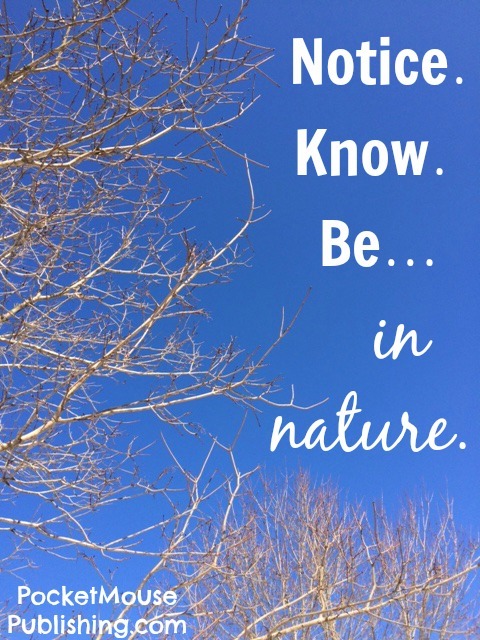 To be in nature we will have to make the conscious choice to go outside. This is what I want for my children and myself. It’s time to go outside and walk the talk. Come along for the adventure! “To know nature we will have to be in nature.” Absolutely! Experience is the best teacher, isn’t it? Thanks for stopping by The Heart of Michelle!